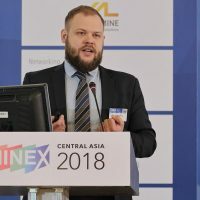 MINEX Kazakhstan offers excellent opportunities for the presentation of mining market reports, changes to legislation, and case studies of the implementation of technical and investment project; and for organising technical masterclasses, and even, attracting the participation of the audience in the discussion of the challenges and changes facing the mining sector of Kazakhstan and the countries of Central Asia. Masterclasses offer the opportunity to present research presentations on advanced methods and technologies, used in the mining industry. The themes and content of the masterclasses are determined by the organisers (e.g. the company sponsoring the masterclass). Masterclasses on the day before the forum normally consist of 3-5 sessions of 60-90 minutes each. Depending on the subject, the masterclass audience will vary from 20 to 100 attendees. Typically, attendees are senior and mid-level operations managers working at mining companies operating in Kazakhstan and Central Asia. Plenary sessions are usually held in the morning in the Sary Arka 1 Hall (capacity 500 people), and last from 60 to 90 minutes. Before the start of the sessions, we invite the audience to take part in polls via our tailored mobile app which allows us to project live answers on the main screen. Session topics should be of interest to the entire audience of the forum and, as a rule, include overviews of industry-wide issues, important changes, trends, as well as talks by the CEOs of leading mining and metallurgical companies. Presentation time is limited to 15-20 minutes. The program committee of the forum welcomes engaging talks which will stimulate the exchange of best practices and new ideas. Presentations proposed for plenary sessions should exclude advertising or marketing content. Technical sessions are usually held in the afternoon and last from 60 to 90 minutes and include panel discussions. Before the start of the sessions, we invite the audience to take part in polls via our tailored mobile app which allows us to project live answers on the main screen. The sessions are usually organised in Sary Arka 1 Hall (capacity 500 people) and in Sary Arka 3 hall (capacity up to 200 people) as parallel tracks. To target specific audiences, technical sessions are organised on non-conflicting themes. For instance, one session would be aimed at operations managers or geologists and second parallel session would be aimed at financiers, HSE, GR, IR, IT or HR managers. Technical sessions often include presentations of new technology case studies, trends in specific market segments, changes in the state regulation of subsoil use, financing or evaluation of projects, among others. The time for presentations is limited to 15-20 minutes. The program committee of the forum welcomes presentations of cases illustrating the introduction of innovative industry solutions and technologies at mining enterprises in Kazakhstan and other countries. Use of advertising or marketing content without reference to the practical implementation examples is not welcome. Finding the best possible technological solution for mine planning, construction, modernisation or closure is a complex task and often involves creative approaches and analyses of alternative opportunities. Striving to achieve greater efficiency in innovative exchanges and peer-to-peer engagement between the mining companies, vendors, and academia, for the second year in a row, the Forum will host the MineTech competition of innovative solutions and technologies. The competition is open to inventors, technology companies and teams of mining and technological universities interested in presenting unique technologies and innovative solutions to improve mining productivity in Kazakhstan and throughout Central Asia. The winners will be awarded with the Competition diploma and prizes established by the Competition Jury. At the Jury’s discretion, winners can be offered a super challenge to implement proposed solutions at the local mining enterprises.